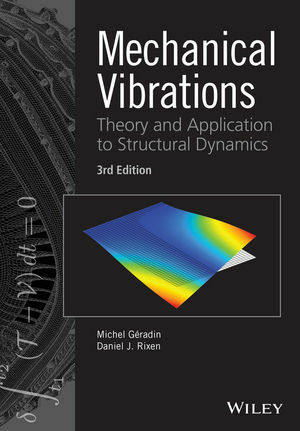 Mechanical Vibrations: Theory and Application to Structural Dynamics, Third Edition is a comprehensively updated new edition of the popular textbook. It presents the theory of vibrations in the context of structural analysis and covers applications in mechanical and aerospace engineering. Michel Géradin holds an Engineering Degree in Physics and a PhD from ULg (University of Liège, Belgium). Successively he has been a research fellow from the Belgian FNRS (1968–1979), Professor of Structural Dynamics at ULg (1979–2010) and Unit Head of the European Laboratory for Structural Assessment (ELSA) of the JRC (European Commission Ispra, Italy) (1997–2010). He has also been a Visiting Scholar at Stanford University (1973-1974) and Visiting Professor at the University of Colorado (1986-1987). He developed research activity in finite element methodology, computational methods in structural dynamics and multibody dynamics. He has been a co-author of the finite element software SAMCEF and co-founding member of Samtech SA in 1986. He is Doctor Honoris Causa at the Technical University of Lisbon (1996) and École Centrale de Nantes (2007), and an Associate Member of the Royal Academy of Sciences of Belgium (2000). He is the co-author of Flexible Multibody Dynamics. A Finite Element Approach (Wiley, 2000). Daniel Rixen holds an MSc in Aerospace Vehicle Design from the College of Aeronautics in Cranfield (UK) and received his Mechanical Engineering and Doctorate degree from the University of Liège (Belgium) supported by the Belgium National Research Fund. After having spent two years as researcher at the Center for Aerospace Structures (University of Colorado, Boulder) between 2000 and 2012 he chaired the Engineering Dynamic group at the Delft University of Technology (The Netherlands). Since 2012 he heads the Institute for Applied Mechanics at the Technische Universität München (Germany). Next to teaching, his passion comprises research on numerical and simulation methods as well as experimental techniques, involving structural and multiphysical applications in e.g. aerospace, automotive, mechatronics, biodynamics and wind energy. A recurring aspect in his investigation is the interaction between system components such as in domain decomposition for parallel computing or component synthesis in dynamic model reduction and in experimental substructuring.